Bulk Mass - is a multicomponent supplement of "bulk", containing components enable the development of muscle mass. 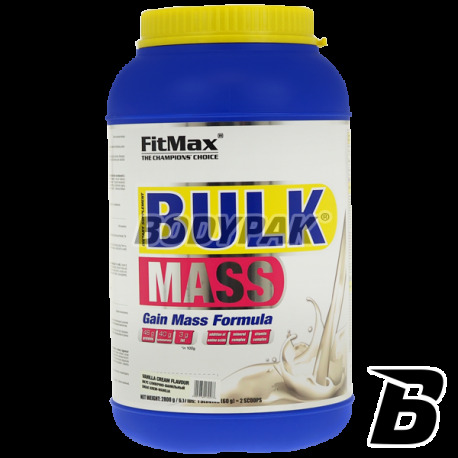 FitMax Bulk Mass - is a multicomponent supplement of "bulk", containing components enable the development of muscle mass. Its base are a mix of complex carbohydrates and proteins characterized by varying degrees of absorption. The product was strengthened by the addition of free amino acids, vitamins and minerals. 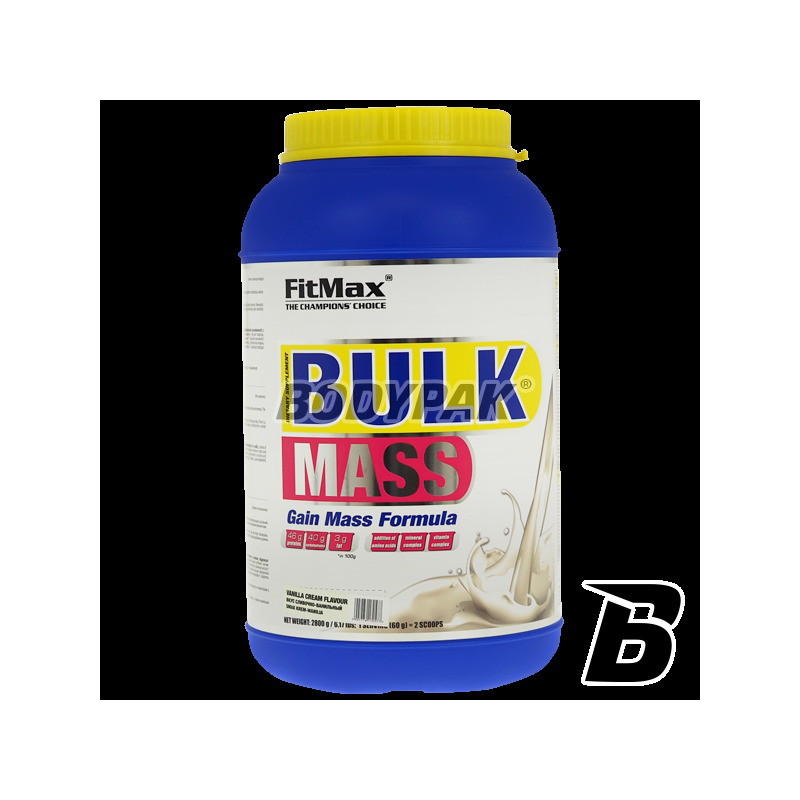 FitMax Bulk Mass is a professional supplement increasing lean muscle mass. Its base is a complex of advanced, complex carbohydrates, based on long-chain maltodextrins. The carbohydrate base has been additionally complemented by an advanced formula containing protein matrix of perfectly assimilated concentrate, isolate and hydrolyzate of whey protein combined with a slowly absorbed, exclusive micellar casein. An ideal ratio of full-value proteins and complex carbohydrates for optimal growth of lean body mass has been enriched with L-glutamine, taurine and a complex of the most essential vitamins. Composition Bulk Mass provides for mutual synergistic action of its individual components, in order to achieve maximum anabolic effect with minimal body fat. Ingredients: whey protein concentrate, micellar casein, whey protein isolate, whey protein hydrolyzate , amino acid blend (L-glutamine, taurine, L-leucine, L-isoleucine, L-valine) Mono and diglycerides of fatty acids - thickener, calcium lactate, creamy aroma, vitamin premix (L-ascorbic acid, nicotinic acid, DL-alpha-tocopheryl acetate, calcium D-pantothenate, pyridoxine hydrochloride, riboflavin, Thiamine mononitrate, pteroylmonoglutamic acid, D-biotin, cyanocobalamin), citric acid - acidity regulator, aspartame K - sweetener, sucralose - sweetener. Masa leci w górę po tym jak oszalała! Ciekawa opcja.. dobry skład, smak i rozpuszczalność.. kupuję doraźnie kiedy nie mam czasu na normalne posiłki. Dobry produkt! Rewelacyjny bulk zaraz po treningu! Wspiera anabolizm mięśni co jest odczuwalne już po paru tygodniach stosowania! chyba najlepszy bulk. . lepszy niż Profi Mass z Olimpa. Smaki ok, ale działanie konkretne. Poprawia przyrost masy mięśniowej.